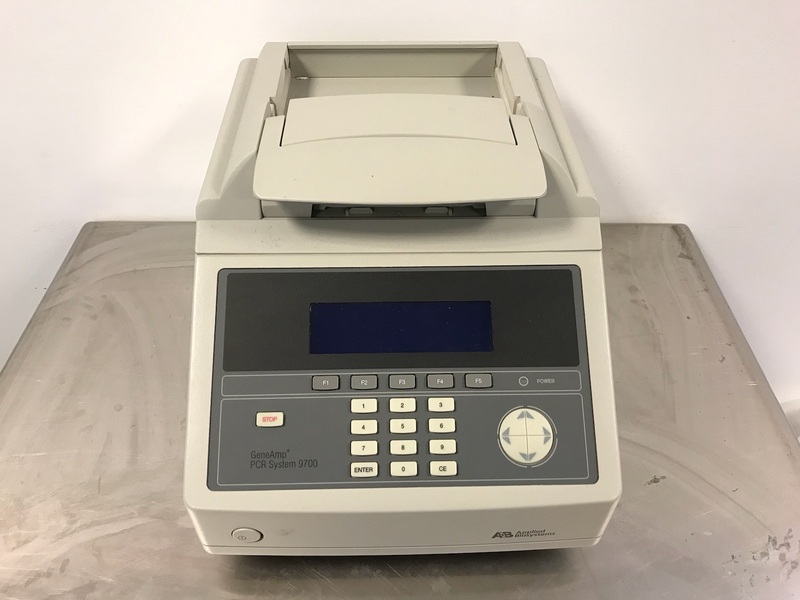 We offer an assortment of used and refurbished Thermal Cyclers ranging from Real Time PCR to qPCR, and Gradient Thermal Cyclers to non-Gradient Thermal Cyclers. Some of our popular manufacturers include ABI, MJ-Research, Bio-Rad, Agilent / Stratagene, and Eppendorf. The DNA Thermal Cycler 480 automates the polymerase chain reaction (PCR) technique for amplifying DNA. Benchmark's TC-32 Mini Thermal Cycler retains the advanced programming features, easy to use software and fast, reliable cycling of the larger TC-9639 Thermal Cycler, but with a smaller block and lower price point. Designed for lower throughput needs, the TC-32 Mini Thermal Cycler has a capacity for 32x0.2ml tubes. The wells are arranged in a 4x8 format, allowing the block to accept strips of 8 as well as individual tubes. The block heats and cools very quickly - at rates as fast as 5°C/second. A proprietary algorithm controls block temperature, bringing samples quickly to the target temperature without any over- or under-shoot. Excellent block uniformity ensures consistency sample to sample. The heated lid is self adjusting - the spring loaded platen in the lid comes firmly into contact with the tops of the tubes to prevent sample evaporation and condensation. There are no knobs to turn or levers to adjust. The temperature of the heated lid can be changed or the heating function of the lid may be turned off. 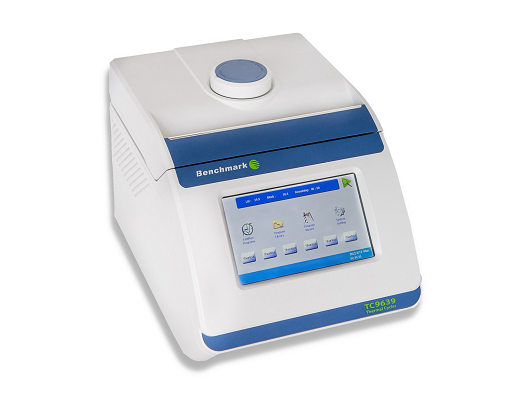 Benchmark's TC9639 Thermal Cycler provides consistent, reliable results for laboratories with medium to high throughput. From its large, touch-screen user interface to its unique, multi-format block, this cycler is loaded with features. A large, full color touch screen serves as the operations center where all functions are accessed. The fully adjustable heated lid prevents condensation and evaporation of samples. Lid temperature can be programmed, and when the block temperature is below 35°, the lid automatically shuts off. Heating and cooling of the block are precisely and accurately controlled within exceptionally tight tolerances by a proprietary algorithm that simulates sample temperature. With the multi-format block, there is no need for the expense of multiple interchangeable blocks. 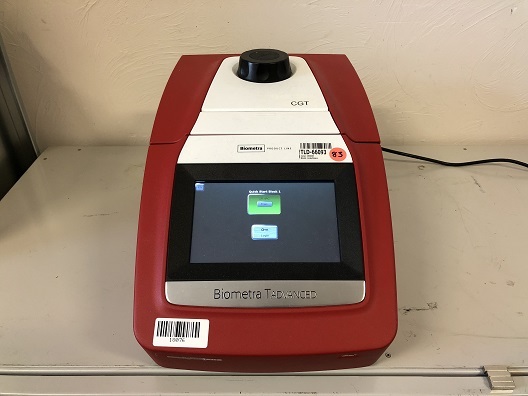 The AnalytikJena Biometra TADvanced thermocycler offers versatility and high performance. The block adapts to temperature changes very quickly and maintains temperature uniformity due to the properties of silver material. This product also features advanced safety measures including automatic restart after power failure and high performance smart lid (HPSL) technology. 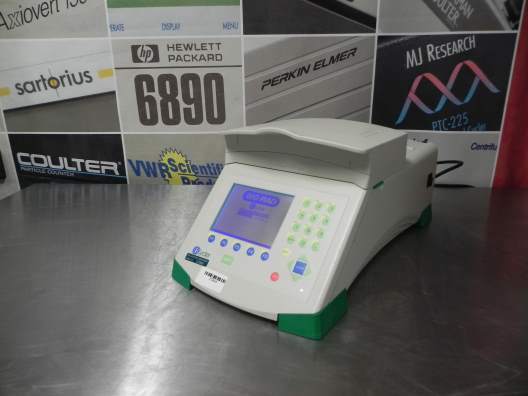 The Perkin Elmer Cetus DNA Thermal Cycler allows for flexible temperature programming, step duration and rapid heating and cooling from step to step for consistent results. Features a 48-position aluminum block for 0.5ml GeneAmp Reaction Tubes. 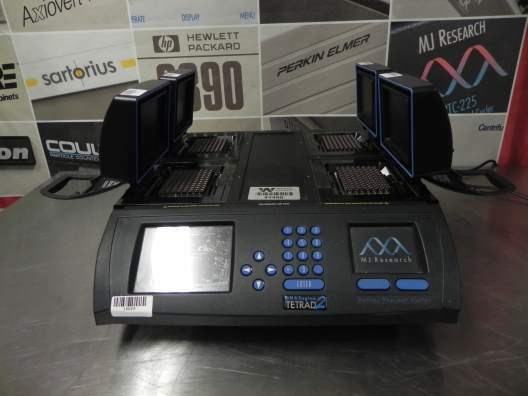 Includes four pre-programmed files: Soak, Time Delay, Thermo-Cycle and Step-Cycle files and 2 demonstration files: Gene-Amp Thermo-cycle and Gene-Amp Step-cycle (93 programmable user files are available). File modifications include, Automatic Segment Extension, Infinite Post-PCR Subambient Incubation. Dimensions (H x W x D): 12" x 13" x 19.25"
The DNA Engine Tetrad 2 thermal cycler is a four-bay thermal cycler ideal for high-throughput research and production environments. 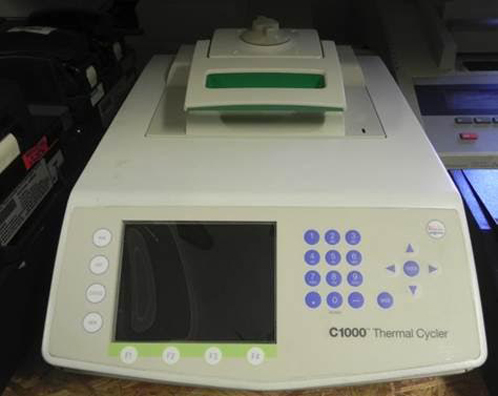 The Tetrad 2 thermal cycler is an updated version of the cycler which powered the Human Genome Project. The GeneAmp PCR System 2400 has a strong performance history. To maintain the instrument in top working order it is advisable to perform routine maintenance on the instrument. Depending on the level of instrument usage, it is recommended that the following procedures be performed at least 2-4 times per year. For high end users a 3-month maintenance cycle is recommended and for lower end users a 6-month maintenance cycle is recommended. GeneAmp PCR System 9700 is specifically designed for the amplification of nucleic acids. The GeneAmp PCR System 9700 consists of a base module and one of many interchangeable sample block modules. 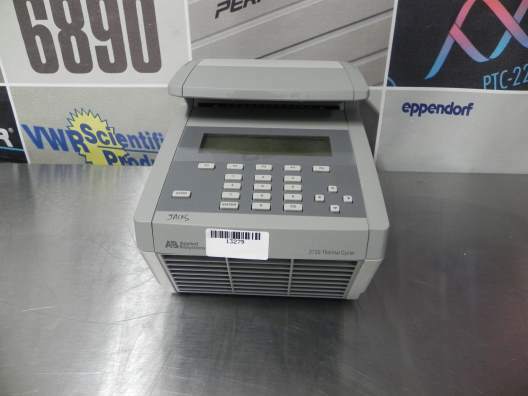 The 96-well GeneAmp PCR System 9700 is designed for use with 0.2 ml reaction tubes or 96-well reaction plates for all of your routine PCR applications. The PxE thermal cycler is a licensed 96 well PCR machine, developed to provide all fundamental features for value for money thermal cycling. The screen is designed to improve user-friendliness by providing detailed information about the statues of the system, in graphical or text format, with a minimal amount of user intervention. The optical module houses the excitation system and the detection system. The Excitation system consists of a fan-cooled 50 watt tungsten halogen lamp a heat filter (infrared absorbing glass) a 6 position filter wheel fitted with optical filters and opaque filter "blanks" and dual mirror arrangement that allows simultaneous illumination of the entire sample plate. The excitation system of the BioRad iCycler PCR Thermal Cycler is physically located on the right front corner of the optical module with the lamp shining from right to left perpendicular to the instrument axis. Light originates at the lamp passes through the heat filter and a selected color filter and is then reflected onto the plate in the thermal cycler by a set of mirrors. This light source excites the fluorescent molecules in the wells.